Stars head coach Derek Laxdal's word may describe the current state of the team best: "in a funk." After a pair of wins to enter the Christmas break, the Stars have just two goals in three games against middling competition, resulting in three losses and a drop to sixth place in the division. "We're not going to score four or five goals a night," said Laxdal. "We have to learn how to grind out a 1-0 game. The league tightens up second half. Right now our guys aren't dealing with it well, and we have to get better." Texas got through the first period scoreless and gained the upper hand when Brendan Ranford put them up 1-0 int he second. The advantage didn't last long as Chris Wagner scored 27 seconds later to tie things at one all. A few minutes later, Matej Stransky took a slashing penalty 200 feet from his own net and Remi Elie earned a cross-checking minor on the ensuing penalty kill. With a 5-on-3 power play loaded up, Stefan Noesen earned the game-winning goal. "We had control of the game at 1-0 and took an undisciplined penalty with Stransky and another on the penalty kill with Elie and that got them back in the game. That's going to come back to bite you." Even as they loaded up the San Diego power play seven times, the Stars had chances of their own but came up empty repeatedly. "[Special teams] were the difference in the game," said defenseman Andrew Bodnarchuk. "They capitalized. We had opportunities to and didn't." The Gulls would add another on the power play to start the third, which would set the final score. Maxime Lagace got the start, stopping 20 of 23 shots against him. Kevin Boyle was sterling for the Gulls again, stopping 37 of 38 tonight for a total of 59 of 60 overall in the pair of games. Boyle's performance was in stark contrast to what Texas has gotten in net this season. He gave the Gulls a huge chance to win despite 38 shots against. Coach Laxdal had a few things to say as well about the cohesiveness of his systems, noting that several players have been going rogue on systems. Laxdal noted, "The only way to get that out of them is not playing them on the power play, but they're good players who have to play there." Texas has until Frida to tune up for a matchup with defending champions Cleveland. Playing against a club with a seven-game losing streak coming into the game, it felt like Texas should have had the upper hand in the game. With a season-high crowd of 6,538 on hand, the Stars got buried early by two goals and fell by a score of 4-0. The desperation of the Gulls overcame the Stars, who were shutout for the first time this season. "Obviously not what we wanted with the great crowd here," said forward Brandon DeFazio. "We feel like we let everybody down." Coach Laxdal continued, "It's easy to say that their work ethic was much stronger than ours in most areas of the game. I'm not saying the effort wasn't there but our effort wasn't direct enough." A rifle of a shot from the left point opened the scoring. Andrew Welinski beat Bow high just two minutes into the contest for the 1-0 lead. The Stars had an excellent chance on the power play just a few minutes later. The arena goal horn and the official's goal light went off, but the refs called Gemel Smith's effort off. It was the correct call with a hard bounce off the inside of the post never crossing the goal line. San Diego built strength off their early successful penalty kills, two in the first. Coming off the second, the penalized player, Texas native Stefan Noesen, left the box and joined the play as it developed up the ice. After some zone time, Noesen notched the second goal of the night on a rebound in tight. "I didn't think we handled the penalty kill well. They pressure hard in the zone. We saw it in the playoffs, and they haven't changed it." Texas pressed hard in the second but came up with just a few posts to show for it. DeFazio assessed, "If we had gotten one at 2-0, maybe the crowd gets into it." San Diego scored two more in the final frame to set the score at 4-0. Samuels-Thomas had a penalty shot goal, the first penalty shot in a Texas game this season. Landon Bow stopped 22 of 26 shots. San Diego's Kevin Boyle got his first AHL win and first AHL shutout in the same night with a 22 save effort. Dustin Stevenson should return Saturday. He has been out dealing with a family issue. Luckily, Texas will have a little bit more breathing room with Jason Dickinson having returned to the lineup yesterday. The Stars iced just 17 skaters on Tuesday against San Antonio. Despite that, they played close with the Rampage until the end. With Dickinson in the lineup (14 pts in 19 GP), that's an excellent 18th skater to gain. The Stars have played the Gulls already this season, dropping that contest 5-4 in southern California. The Gulls sit just below Texas in the standings, but the margin is not close. Texas is four games above .500, which is where San Diego finds itself. The Gulls were five games above .500 very recently but have dropped seven straight (0-5-1-1) to fall precipitously in the standings. It's the first time the Stars have played San Diego at home since the Gulls eliminated Texas in the playoffs last year. For Texas, will the reign of Landon Bow continue? With a day between each game this week and five days off before the first game next week, it's reasonable to say that Bow would be in the net each game. While not stellar on a league-wide basis, Bow's stats are the best of any goalie the Stars have had this season. The beleaguered Texas lineup will get some assistance ahead of tomorrow's game against San Diego with Jason Dickinson returning to the AHL team this afternoon. Dickinson played in just one game during his third recall and has two games total on the season in Dallas. 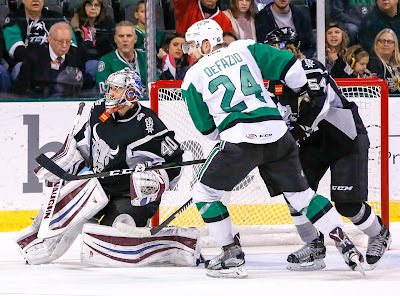 The Texas Stars have assigned Philippe Desrosiers to the Idaho Steelheads of the ECHL. Desrosiers probably did not spend much of the break in Austin, of course. He was likely back with family in Canada. Idaho plays tonight in Rapid City. 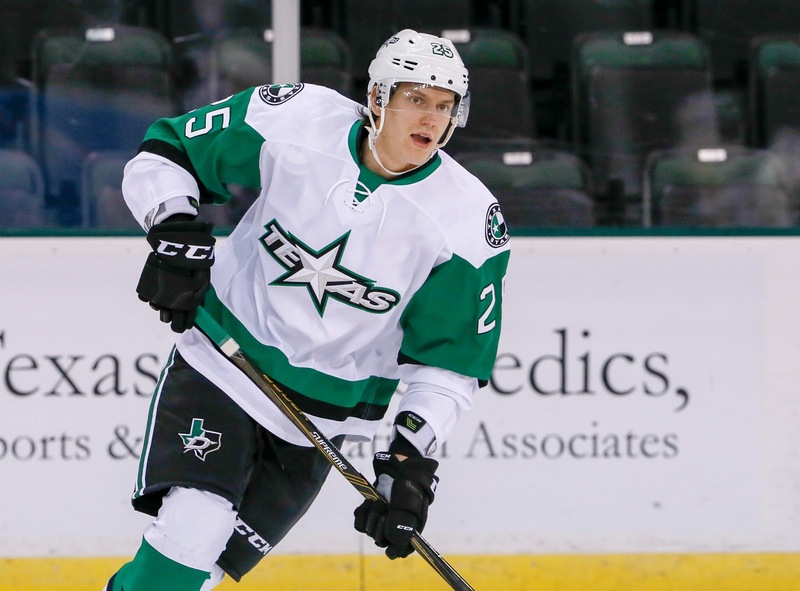 A depleted Stars' roster fell to the San Antonio Rampage this evening at the AT&T Center. The club lost Jason Dickinson to recall and clearly had a few injuries or other issues on defense that forced Matt Mangene to move back to the blue line. The Stars shuffled things around through the game as they only had 17 skaters in the lineup. San Antonio opened the scoring as Jim O'Brien scored a quick one three minutes into the game. Texas answered on the power play in the third, but a goal by San Antonio just two minutes later would be the ultimate winner. The Rampage winner came on the power play, just 14 seconds away from the expiration of the minor. Landon Bow stopped 23 of 25 and took the loss. 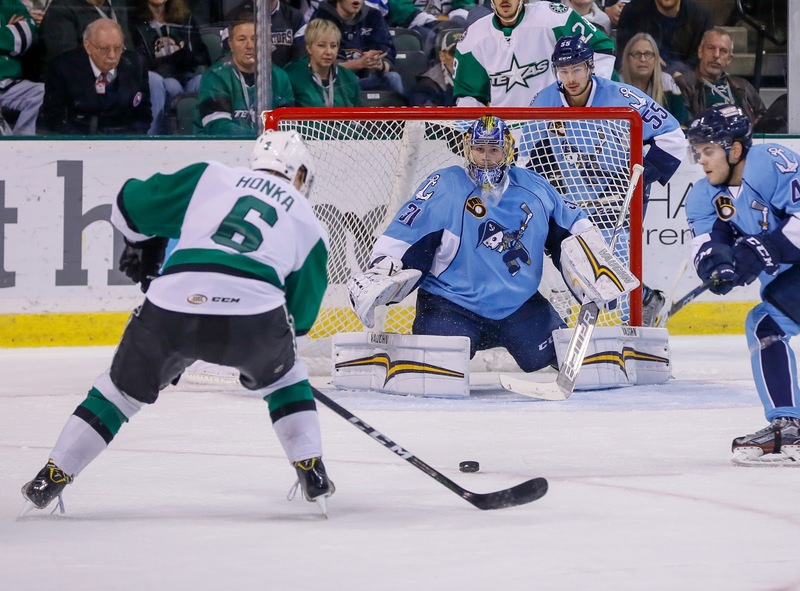 Texas was on a four-game win streak against the Rampage dating back to the start of the season. The Stars now head home to play a pair against San Diego. Having won the first two in the set, Texas faces San Antonio again for the third game in the Alamo City. With several days off, the Stars will hope to get a number of players back to health. Werek has been mentioned several times by Coach Laxdal as a player who could come back soon. Backman and Ully have been practicing as well. With the spacing of games this week, I wouldn't be surprised to see Landon Bow start all of them. I know he probably won't, but it still wouldn't surprise me if he did. Note that Joe Faust has been added back on a PTO after being released on Friday. He played in Allen that night and scored the team's first goal, starting a comeback that earned Idaho a 3-2 shootout win. Before hitting the Christmas break, Idaho (16-10-3) made a trip to the Lone Star state last weekend. Despite only playing each other on a few occasions, the Steelheads and the Allen Americans have developed a nasty rivalry borne of jealousy and hardened in the playoffs. Idaho, being the Dallas Stars' affiliate in the ECHL, gets more attention than any other visitor to the Allen Event Center from both the local fans and the NHL team's front office and hockey ops. The games this past week were no exception as Scott White, Jim Nill, J.J. McQueen, Mike Valley, Jeff Reese and Les Jackson all made appearances for the games. Having the visitor get the fan adoration in your own building is a good ingredient for healthy hate. Idaho meanwhile has some hate of its own as the Americans bumped the Steelheads from the playoff race last season in Game 7 overtime. Allen went on to crush league-favorite Missouri en route to their second Kelly Cup. This past week's rematch was heated at times but never devolved into pugilence. Here are a few quick evals on the weekend. Philippe Desrosiers started the first game on Thursday. Idaho did not play well in front of him, and the team allowed six goals, all against Desrosiers. The Steelheads certainly weren't helping the effort but Desrosiers was not solid. With Jeff Reese and Mike Valley in the building, Desrosiers had a lengthy chat with Reese after the game. He was recalled the next day to Texas, and Brandon Komm started the second game. Neil Graham: "We won't the game on him by any means. It's a team win or a team loss. My message postgame was that we are all accountable for that performance. We will make adjustments structurally. Often it's the small details that get away from you in a game like that." Neil Graham: "For Phil, it's been an up and down year. It's really important for those young goalies to remember one game at a time. You can't control who starts. All you can do is make saves when you get your starts." Komm had an excellent outing for the Steelheads the second night. After Allen jumped out to a 2-0 lead, Komm stopped all the rest thereafter. Joe Faust, fresh off two games in the AHL, scored the opening goal for Idaho. Neil Graham: "If Faust is on the roster, he'll be in. He's been very solid for us all year. He's earned every bit of it and he's really taken advantage of the opportunity." Komm's third period was a fantastic effort, for which he should have earned a star of the game. Neil Graham: "Once the second goal went in, I had a feeling that would be it. He's a competitor and you could see that pushback." I really liked the overall game that the Idaho Steelheads played on Friday. They didn't get overwhelmed and they had their goaltender lockdown a game to keep them in it. That sounds like the type of performance that Texas could have used early on in the season to keep them in many of their games where they found themselves behind the eight-ball after two. I was in Allen covering the Steelheads' game, so I didn't have eyes on everything in this game. Here's the high-level report. 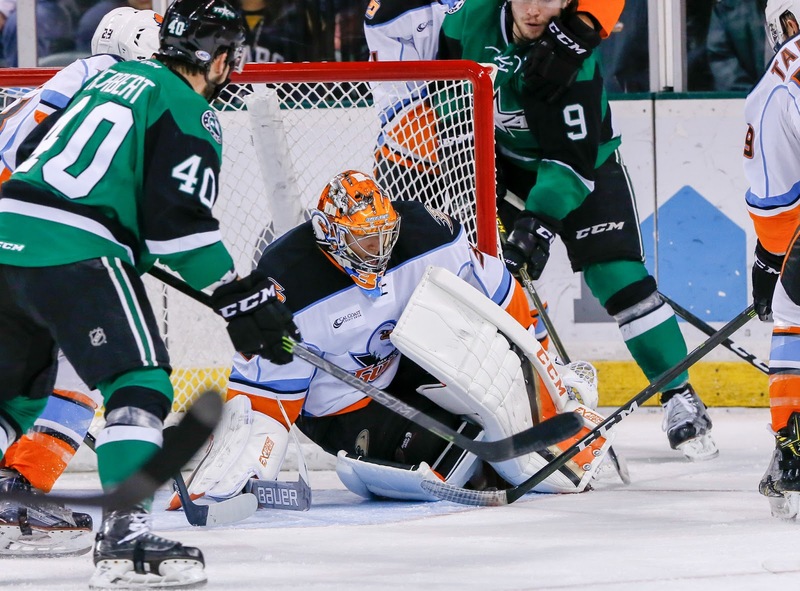 Caleb Herbert notched three points in just his fifth AHL game of the season, but it took some late-game heroics from a veteran to put Texas on a win streak heading into the Christmas break. Herbert tipped a shot from Julius Honka and scored a clean one in the second to make it 3-2 Texas. He assisted on Gemel Smith's goal a few minutes later to make it 4-2. In the third period, San Antonio clawed back to even at four. Matej Stransky found twine with just 12 seconds left to set the final score at 5-4. Landon Bow got the start and stopped 33 of 37 shots against him. Texas chased starter Spencer Martin but Jeremy Smith took the loss, as he allowed the final goal. These two teams rematch after the Christmas break in San Antonio next Tuesday. 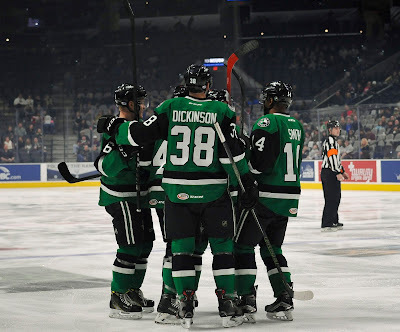 The San Antonio Rampage knotted the game with less than three minutes remaining in regulation, but it was Matej Stransky who scored the key goal with 12 seconds left to give the Texas Stars a 5-4 road win on Thursday night in front of 4,176 in attendance at AT&T Center. Stransky’s game-winner gave the Stars (15-10-1-1) a two-game sweep of their rivals in the home-and-home series. 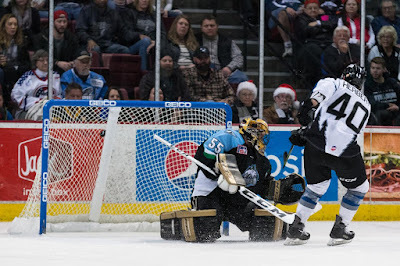 The Rampage (12-15-2-0) suffered their fifth loss in the last six games. Caleb Herbert finished with a three-point game for the Stars (2-1=3). 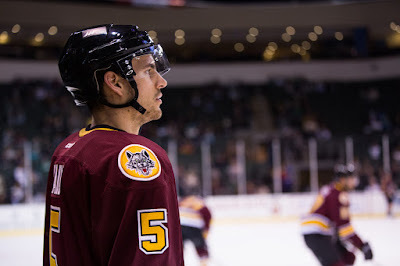 Justin Dowling tallied an assist to take over sole possession of third place in Stars history in points (192) and assists (124). The Stars will visit the Rampage again on Tuesday at 7 p.m. CST after the American Hockey League’s holiday break. Rocco Grimaldi tapped in a rebound goal at the left post to tie the game at 4-4 with 2:42 to play in the game. In the closing seconds, Travis Morin slipped a puck into the goal crease that Stransky was able to bang home in a crowd of players for his tenth of the season. The scoring began just over a minute into the game when Herbert deflected a Julius Honka shot from the point for his first goal in a Texas sweater. The Rampage responded with back-to-back goals from Jim O’Brien at 3:54 and Mike Sislo on the power play at 8:09. Trailing 2-1 entering the second, the Stars answered back with three goals of their own to take a 4-2 lead. Dowling’s milestone assist two minutes in set up Morin in the slot for a power play goal and his team-leading 11th of the season overall. Herbert snapped a wrist shot off a Texas faceoff win past San Antonio’s Spencer Martin at 3:59, and Gemel Smith finished off a two-on-one rush from the right circle at 11:05 with Herbert adding the assist. Landon Bow earned his fourth career AHL win in just his sixth appearance this season for the Stars with 33 saves. Martin was chased from the game after Smith’s goal and finished 11 of 15. Jeremy Smith came on in relief to stop eight of the nine shots he faced. Texas finished 1-for-4 on the power play. San Antonio went 1-for-6. 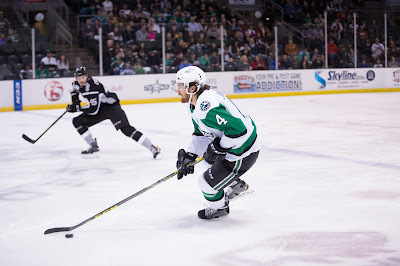 The Stars have won four straight games against the Rampage this season. A bounce back performance was certainly what Texas needed after the 9-1 outing against Milwaukee on Saturday. 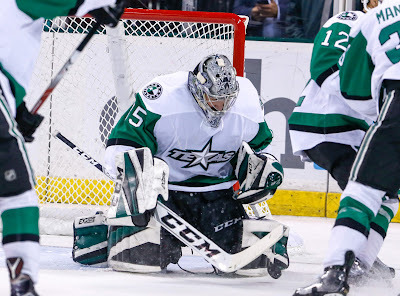 Divisional rival San Antonio obliged as the Stars exorcised some demons in the 2-1 win. "We challenged our group to get better defensively and I think we answered the bell," said Coach Derek Laxdal. "Closing out the home stand with a win was good for us, especially after the losses against Milwaukee." The defense activated tonight with Nick Ebert scoring his third of the season. Strong defensive zone pressure was also part of the equation that put Texas back in the win column. Ebert noted, "We came out with a good effort and it's a good step back to where we need to be. We were a lot better for Bow tonight. Our coverage was tight with no breakdowns and that was an issue last week." Texas was all over the Rampage early in the game, despite it not being obvious on the shot count. It was evident on the scoreboard quickly though. A centering pass from Brandon DeFazio to a trailing Ebert beat Jeremy Smith for the 1-0 score. "I jumped in the play tonight a lot more than I have in the last couple games. It was more open for me. That's a part of my game I have to be sure to establish early in the game." Texas continued the upbeat pace through the first period as some of the callups started to show their mettle in the game. Joe Faust had several excellent offensive chances in the first period and could get another look tomorrow night, according to Laxdal. Caleb Herbert started the game on a line with Gemel Smith and Jason Dickinson, availing himself well of the opportunity and earning another shot with the pair tomorrow himself. Laxdal commented, "He did what we wanted him to do. I think he was a little nervous, and I think he'll be a better player tomorrow night." The Rampage got a goal that really shouldn't have been late in the second period. A streaking J.T. Compher put a bad angle shot on Bow from the right wing goal line, beating him high on the far side. Bow went for a blocker stop but should have opted for the glove. Texas would orchestrate a great chance of their own, as San Antonio took successive minors to land the Stars on an extended 5-on-3 to end the frame. With patience, Brandon DeFazio set up Gemel Smith with a cross-crease pass. Smith slammed the puck home on the backdoor before goalie Jeremy Smith could seal the pipe with his pad. The third period saw a strong push from San Antonio, including a 5-on-3 for 25 seconds. "We went back to the chalkboard [on the PK]," said Ebert. "We had to tighten up. The kill on the third on the 5-on-3 was awesome for us and we really needed it." San Antonio went with their big line of Compher, A.J. Greer and Jim O'Brien for much of the final two minutes with the 6-on-5 advantage. The Rampage were unable to establish a strong offensive zone presence, despite the advantage, and would not score. The Stars will travel to San Antonio for the rematch tomorrow night. The Texas Stars will look to bounce back from an embarrassing outing on Satuday, which saw them defeated by eight goals at home. San Antonio is last place in the division but only by a game. It could provide a chance for the Stars to get back to winning ways. Over the past few weeks, the Rampage have been getting more players back to health. However, they seem to be stuck at the level of .500 hockey, consistently one or two games below even since early November. Texas will be fielding a ragged squad. Denis Gurianov headed to Canada for the World Juniors on Sunday. Mattias Backman practiced last weekend but did not play. Ethan Werek and Cole Ully also appear to still be out with injury. Add to this the fact that Dustin Stevenson is suspended for a game after receiving an instigator penalty in the final five minutes of regulation on Saturday. As a result, Texas signed D Joe Faust to a PTO on Monday. If all the above holds, Texas will have just one healthy scratch for tonight's game. As an organization, Dallas still continues to struggle with goaltending and now AHL level has claimed another victim. Landon Bow, who had been flying high in his first two games, is now at a 3.67 GAA and .903 SV%. It's anyone's guess what Texas decides to do for starting tenders this week. Neither Lagace nor Bow distinguished himself last weekend. Maybe Desrosiers gets a shot? According to the ECHL transaction wire, the Texas Stars have added defenseman Joe Faust to their lineup today. Faust is in his second pro season and currently leads all Steelheads defensemen in scoring with 17 points in 27 games. He also sports a team-best plus-7 rating. Faust spent all of 2014-15 with the AHL's Albany Devils and split his 15-16 campaign between the Devils and the ECHL's Adirondack Thunder. This may have something to do with the instigator penalty that Dustin Stevenson took in the final five minutes of the Saturday night game. That's an automatic one-game suspension. Matt Mangene won't be available to drop back on D since the Stars need him up front with the loss of Denis Gurianov to the World Juniors. Take your pick on verbs: walloped, crushed, humiliated, etc. Texas got into the Christmas spirit, gifting nine goals to the Milwaukee Admirals this evening in Cedar Park. While not the worst performance in terms of goals against, it is the second-worst margin of defeat that the Stars' have ever suffered. Texas was beaten 10-1 in 2011. Maxime Lagace got the start, but was quickly pulled for Landon Bow. Travis Morin scored the only Texas goal. 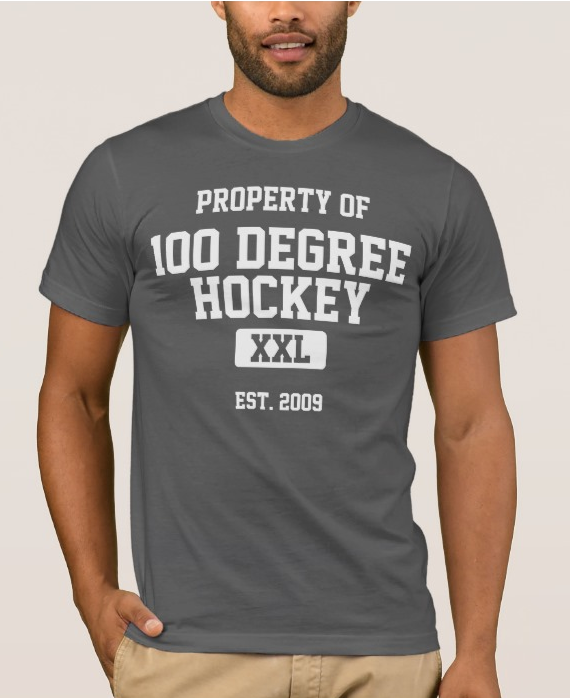 Every December, there's something extra in Santa's bag for all the hockey fans of the world. Starting the day after Christmas, the annual World Junior Championship will kickoff in Toronto and Montreal. 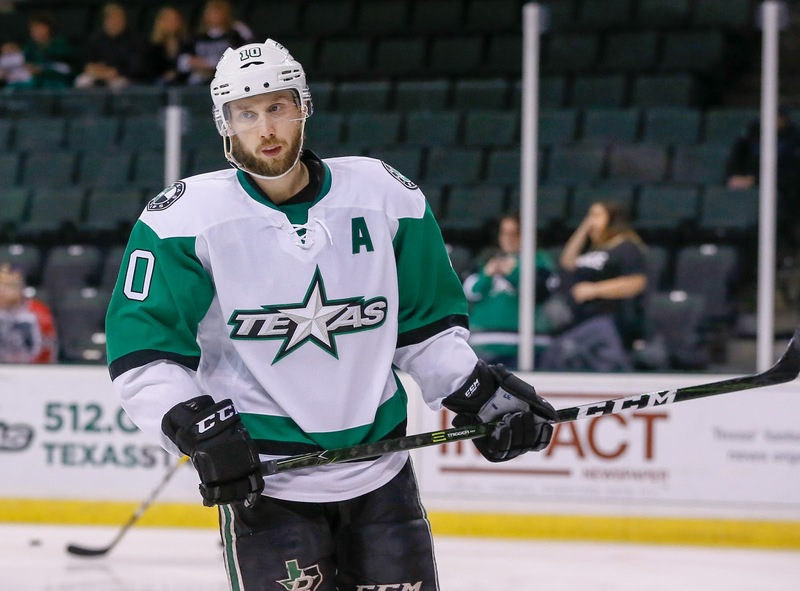 This season, the Texas Stars will again have a participant with Denis Gurianov leaving the team Sunday to hit training camp and ultimately play for the Russian national team. "I am happy to play at the World Juniors," said Gurianov. "It's every players dream to play in the World Juniors for their country." Gurianov is not the first player to take the mid-season sojourn to the tournament. In 2015 and 2016, Julius Honka went to the tourney to play for Finland, winning gold in Helsinki in 2016. "The national team games are really high end games," noted Honka. "They are the best players in the world your age. It's a little different than the regular season games. It's really good experience for whomever plays there." While losing a top-9 forward for several weeks will certainly hurt the Stars' lineup, head coach Derek Laxdal is confident that the experiences Gurianov will have in the tournament will outweigh any loss in the lineup. "Anytime you can play for your country and be a part of that tournament, it's quite a privilege and there's a lot of honor in it. It's not going to be easy, but I think it's going to be a great character builder for him." It is a tournament, so the games are packed in tight. The Russian team will open against Canada on Boxing Day and play four games in six days. If they advance, several more will be added to the slate all culminating in a potential championship game on January 5th. Russia has medalled in the tournament for six years straight. "They're going to come back and be a bit tired. It's a heavy tournament in a short amount of time, a lot of hockey. He'll need a break to get back but he'll come back confident and more mature." Laxdal has been extremely pleased with where Gurianov is in his development. The tournament is a stepping stone to his continued growth in the second half of the season. The team would like to see him shoot the puck more instead of passing and develop the small skills around the net to attack the defense and put pucks in good areas to get shots off the net. Overall, Laxdal praises Gurianov as "very responsible" in the defensive zone and compliments his play at 5-on-5 and overall speed in the game. Obviously, Coach Laxdal is rooting for Gurianov to succeed at the tournament personally, but as a Canadian, he's rooting for the Canadian junior team. Gurianov and Laxdal, who played for Canada in the tourney in 1986, have a sidebet on the opening game for Russia versus Canada. Loser buys the winner lunch. Gurianov will miss at least five games for Texas while at the tournament. Depending on how deep Russia goes, he may also miss games against Cleveland on January 6th and 7th. Same hockey teams at the (almost) same hockey time. Back-to-back sets for Texas have been a mixed bag with the Stars going 4-4-1 in the second game of the set. It's actually extremely rare that Texas loses the first game of a back-to-back. It hasn't happened since October 21st against the Reign and even that was in OT. Ethan Werek re-injured himself in last night's game and could be out for tonight. Landon Bow looks ready to go if called on. Lagace and Bow should be your goalies, as Philippe Desrosiers practiced late with injured Cole Ully and others. Mattias Backman practiced today in regular dress and could be a player this evening. Up against the best in the conference, Texas was stymied by great goaltending in the final frame from Milwaukee's Marek Mazanec. Despite the score of three goals against, Mazanec was the difference in the game. "The goaltender was the difference in the third period," noted Coach Laxdal. "We had three or four grade A looks where he made huge saves." The Stars kept things tight throughout but did not develop a strong sense of urgency until the third period. By the time they had, Mazanec was locked in. Justin Dowling summarized, "I think it was maybe he was in our heads a little bit. When we get that many chances, usually they go in the net. That's how it goes some nights." Off the hop, Texas allowed two quick goals, putting them down 2-0 just five minutes into the game. "Right off the bat we were watching a bit. We were sleepy. Sometimes when a top team comes in, you get caught watching a bit." What could have been a long night for the Stars was quickly counteracted by Remi Elie's fourth of the season. It was a sweeping move right-to-left across Mazanec, easily finished into an open net. Justin Dowling stepped up next as the penalty kill continued its scoring ways with a shorthanded marker. "[Coach Karl Taylor] wants us to pressure more and pick and choose the spots to pressure when pucks are on the wall or backs are facing us. In the NHL, some of the best PKs are where players are flying around and not letting them get set up." Early in the second, Texas claimed a lead with Brendan Ranford finishing a rebound off a Travis Morin shot. Morin was playing in his 500th career AHL game, a milestone acknowledged before the game. The aggressive PK was victimized shortly thereafter with Reid Boucher left all alone to beat Landon Bow and tie the game at 3. Felix Girard pushed the Ads ahead with a wrist shot early in the third. It would be the game winner. Texas waited until the third period to get gritty, in their coach's estimation. It's been a recurring issue for the club. "We were a little cute in the offense zone," he assessed. "Dickinson, Smith, and Gurianov gave us a lot of energy in the third period and got us kickstarted." But luck and skill combined to deny Texas. Gemel Smith muffed an easy tap-in on a 3-on-1. Marek Mazanec had repeated ten-bell saves, including a stretched-leg effort on Justin Dowling that tricked the goal horn operator at the CPC. A final 6-on-5 effort would fall short and Texas would fall 4-3. The rematch is tomorrow night. Landon Bow left the game in the third period with the flu. Lagace stopped all three shots he faced in relief. UPDATE: Landon Bow will get the start for Texas. Julius Honka has been reassigned from Dallas. HDH: Is Milwaukee back to "Admirals hockey" this season? It certainly seems so from the win loss record and the goals against numbers. DL: The record looks fantastic but there have been many occasions that the results could have just as easily fell short. The Admirals are getting coined the Cardiac Kids this season for their resilient comeback ability in games. They didn't lose a single game in regulation during the month of November but that also includes seven out of ten games played in that month going to overtime or even further. They play with good pace. They are starting to do a good job working around the net for gritty goals. The lone blip recently is persistent penalty troubles caused by a little over-aggressiveness. The running joke I've had is the Admirals have been either the top team in the league or one-of this season and we've yet to see them playing at their full potential. HDH: It looks like this squad has some solid vets who are making an impact (Smith, Zolnierczyk, Bass). Is that a correct read? What's the makeup this year? DL: The veterans that were brought in this season have been tremendous. Trevor Smith is a great on and off ice leader. Harry Zolnierczyk, Adam Pardy [Ed. Note: a former Texas Star], Cody Bass, Mike Liambas, and Adam Payerl all add such a great veteran style leadership to the locker room. I feel that, especially through some of these up down and around cycles within games, has been the driving force to a lot of the success had this season. Nobody ever looks like they are in a panic. Everyone is always calm and under control. HDH: Goaltending is always a strength in Milwaukee. Is that still the case this season? Should Texas expect to see each goalie once this weekend? DL: When Juuse Saros arrived a season ago he did so with the Nashville Predators trading Magnus Hellberg away for a packet of peanuts just to clear a spot for him in the AHL. He had a massive amount of hype surrounding him that I just didn't think he could meet. Not only did he meet expectations a season ago but he has long since surpassed them. Him allowing four goals in his last AHL outing may have been the best sign I've seen from him just to let me know Saros is in fact human. That said, the Predators don't appear to have much of a clue as to who or how they operate the back-up gig to Pekka Rinne this season. Saros isn't here anymore. Marek Mazanec is. This is already the third time this season that they've rotated the two and the idea is to maximize minutes for both. I'm sure Jonas Gunnarsson, our AHL back-up, is a bit lost as to when he gets to do the same but it's the way it has been. I don't know if they will rotate Gunnarsson in but both should be game should they get the call. DL: Oh. Well. That sounds like a whole lot of not good for us then! The catch with all the penalty troubles that the Admirals have been running into isn't out of sheer stupidity or dropping the gloves. With that new (and really dumb) AHL Fighting Rule in place the Admirals are tied with the Grand Rapids Griffins for the least amount of fighting majors in the league this season with only five fights. The Admirals penalties have simply been over-aggressive plays. Milwaukee Admirals head coach Dean Evason describes it as the players are putting themselves in a position for the penalties to be called and the referees are calling them. There is a balance between hard-nosed defending and puck pressure and shooting yourself in the foot by going to the penalty box a lot. 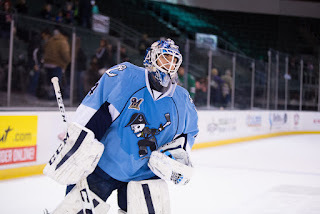 The Admirals are fourth in the league for being shorthanded the most amount (121 in 23 games). It needs to change regardless of how well the penalty kill has been. HDH: Any other interesting stories? DL: There's always plenty of good stories around this organization. I feel the recent NHL call ups for Frédérick Gaudreau and Mike Liambas are up there for some of my favorites to see: undrafted guys, ECHL, AHL, earn then NHL deal, and then get to the NHL. It was fantastic to see. Then the rookie defenseman Alex Carrier is another one. He has been playing alongside Pardy since the Admirals acquired him early in the season and the 20-year old just hasn't looked his age one bit. Carrier has 15 points (3 goals, 12 assists) in 23 games and is present and almost first choice defenseman in all situations. He's a good one. 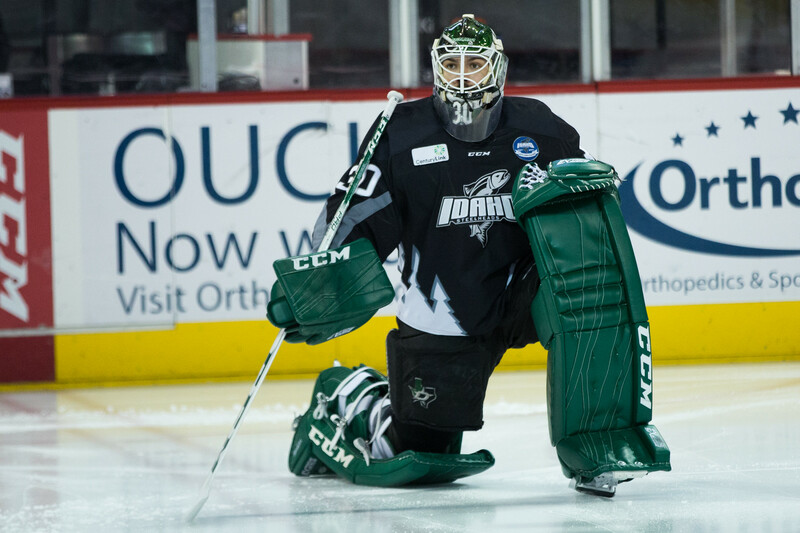 The Dallas Stars have reassigned goalie Philippe Desrosiers from Idaho to Texas this afternoon. The second year pro has not had a sparkling record in the ECHL so far this season. He's 1-1-1 in five games with a 3.63 GAA and .907 SV%. For now, Texas is not assigning anyone back to Idaho, putting Bow, Lagace and Desrosiers all in play for this weekend. The injury woes of the Dallas Stars this season have been well-documented. The club has already lost 142 man-games to injury on the season. Those injuries started in training camp, and the hits just kept on coming. Cody Eakin, Jason Spezza, Patrick Sharp, Jiri Hudler and Mattias Janmark would all drop from the lineup for various reasons. Janmark was lost for the season following a knee injury requiring season-ending surgery. And so, in stepped the Texas Stars. Players on Texas’ opening night roster have now contributed 25 man-games to the NHL side since the start of the season. A dominant victory from Texas last night leads to what should surely be a chippy contest tonight. The big story for the Texas Stars will be the man in net. 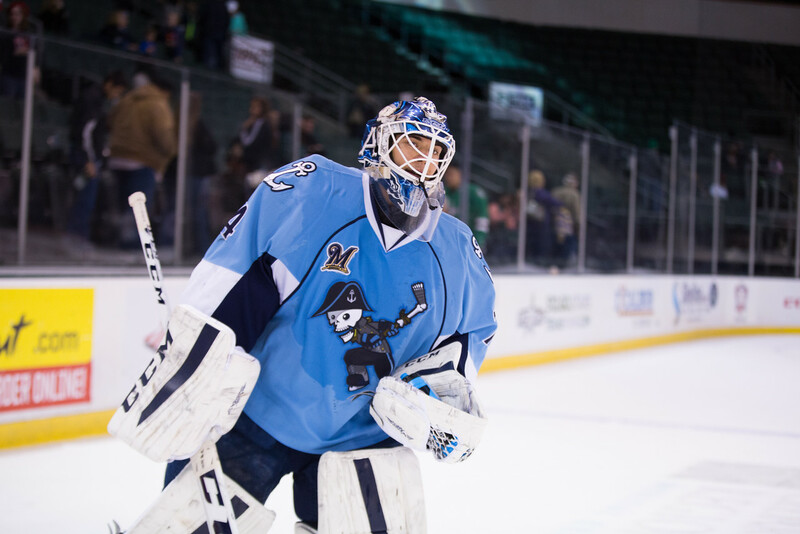 Landon Bow is expected to make his first AHL start after stopping 34 of 35 last night in relief. UPDATE: Jason Dickinson has been reassigned. 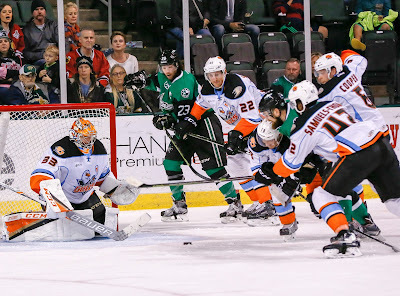 The idle Texas Stars have been passed up this week by a few teams and find themselves in fifth place in the Pacific, even with a .571 points percentage. In fact, the 6th place Barracuda have a .559 percentage. Rockford and the Stars have already played once this season in Illinois, a game Texas lost in their only shootout of the season so far. This weekend is the first and only visit the IceHogs will make to Texas. After this weekend, the two teams won't play again until the end of March. Rockford is in last place in the Central Division, sitting five games below .500. The IceHogs are having a lot of difficulty scoring goals. They rank second to last in the league with just 2.22 per game. They're allowing 3.13 per game at the same time. Their leading goal scorer right now, Spencer Abbott, has only five tallues on the season. Further, the goaltenders on their roster at the moment have a combined 1-5-3 record. The point of all this is that Texas needs to collect all four points this weekend as they start what is essentially a five-week homestand without a game outside Texas until January 11th. Caleb Herbert was recalled to Texas today. The Stars needed another body with Jason Dickinson in the NHL. The Texas Stars, American Hockey League affiliate of the NHL’s Dallas Stars, announced Thursday the team has recalled forward Caleb Herbert from their ECHL affiliate, the Idaho Steelheads. Herbert, 25, has recorded eight points (4-4=8) in 13 games this season with Idaho, and has appeared in three games for Texas. The 6-foot, 200-pound forward tallied 14 points (10-4=14) in 15 games last season for the ECHL’s South Carolina Stingrays, and also recorded two assists in 26 games with the AHL’s Hershey Bears. The Bloomington Minn. native was a fifth-round pick of the NHL’s Washington Capitals in 2010. The Dallas Stars have recalled forward Jason Dickinson to the NHL. It's his second NHL recall. Last year, he scored his first NHL goal in his first NHL game late in the season. Texas has Mattias Backman on injury with several more days to recover. If he does, Mangene can shift to forward and there won't be much impact to Texas. If not, Ethan Werek will jump into the lineup. 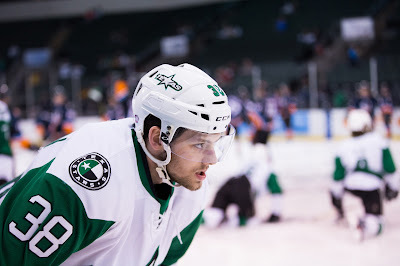 Dallas Stars General Manager Jim Nill announced today that the club has recalled forward Jason Dickinson from the Texas Stars, Dallas' top development affiliate in the American Hockey League. Dickinson, 21, has registered 10 points (4-6=10) in 13 games with Texas this season, while he ranks sixth on the team with a +6 plus/minus rating. The forward began the 2016-17 season on injured non-roster list with a hip injury. The 6-foot-2, 205-pound native of Georgetown, Ont. was selected by Dallas in the first round (29th overall) of the 2013 NHL Draft. Dickinson has appeared in one career NHL contest, making his debut and scoring his first career NHL goal (1-0=1) on April 7, 2016 against Colorado. The Manitoba Moose never trailed in today's afternoon game in Winnipeg, as they dropped the visiting Texas Stars 5-4. The game was Texas' final contest of the season in Canada. Two goals from their captain, Travis Morin, could not overcome a resurgent Manitoba offense, which scored two goals in twenty seconds early in the first and never looked back. Prior to the game, the league suspended Brenden Kichton for his match penalty yesterday against Texas, an illegal check to the head. Gemel Smith, the recipient of that check, played today without incident. Travis Morin got Texas on the board in the first after those quick Moose goals, but Manitoba finished the frame up 3-1 on a power play goal. Texas evened things up in the second with even strength markers from Matej Stransky and Dustin Stevenson. Brandon Anselmini earned his first AHL point on Stevenson's goal. Danny DeSalvo notched the go-ahead goal early in the third on an unassisted effort, but Travis Morin potted his second with a power play tally with 4 minutes left in regulation. Apparently set to go to overtime, DeSalvo stepped up against for the Moose. With 83 seconds remaining in the frame, DeSalvo pierced Lagace on the power play for the 5-4 final. Maxime Lagace got the start and halted 26 of 31. Texas is off until Friday back in Cedar Park against the Rockford IceHogs. The Texas Stars had the Moose in their crosshairs from the drop of the puck today in Winnipeg. After a 1-0 first period on a goal by Matt Mangene, Texas mounted a four-goal second period. Brandon DeFazio scored the fastest goal to start a period in franchise history with his 8th of the season just 11 seconds into the frame. Denis Gurianov scored 28 seconds later to make it 3-0. With Austin Fyten's goal at 4:25, Eric Comrie saw his night come to an end. Ondrej Pavelec would be pierced twice more with Mike McMurtry and Jason Dickinson each collecting their fourth goal of the year. With the score at 6-0, Texas just missed the clean sheet for Maxime Lagace. With 57 seconds left, Julian Melchiori scored a meaningless goal to break up the shutout. Regardless, the Stars were 2/8 on the power play and perfect on the PK in five chances. Texas makes its first and only visit to Canada this season for a pair of afternoon games in Manitoba. The Moose come in with the same record as Texas, ranked 3rd in the Central division. Their play so far has been extremely streaky. They are on a three-game winning streak with a string of road victories in Milwaukee, Chicago and Rockford. They lost 4 of 5 before that and won four in a row before that. Many of the names on the Moose roster are recognizable still from the Calder Cup year as former IceCaps, including Brenden Kichton, JC Lipon and Patrice Cormier. Another name that is imminently recognizable is Scott Glennie. The former Star put his career back on the map after losing an entire year to injury. In 12 games, Glennie has 2-6=8 with a power play goal and a game winner among them. In net, the Moose have Eric Comrie with a 6-5-1 record (.920 SV%). Ondrej Pavelec was demoted from the NHL and has a 4-2-1 record (.906). Ken Wiebe at the Winnipeg Sun wrote a great article considering Pavelec's position in the organization. Texas is coming off a tough loss in Chicago where they seemed to have control of the game until a late power play goal downed them. Playing from behind has been a huge issue for the Stars this season. When you combine it with their penalty trouble, that's where much of the trouble has come in. So, it's cliche but Texas needs to score first and not take penalties. Sometimes the simplest things are the hardest. Jason Dickinson potted a goal and an assist, but the comeback was stifled by a late Wolves power play goal. The game saw seven combined goals with five of them scored in the opening 18 minutes of the game. Texas opened the scoring with Dickinson's 200-foot effort to snap one past Jordan Binnington just 32 seconds into the game. Chicago stepped up with the next three goals though, putting Texas on the back foot. Sterling went first with an equally streaky goal to Dickinson. On the power play, Brad Hunt bombed one from the left point to beat Lagace through traffic. A giveaway by Matej Stransky generated a 3-on-2 the other way for a pretty tic-tac-toe finish by Landon Ferraro. Stransky, motivated by the goal against, went out the next shift and got it right back. A flatulent centering effort by Chicago ended up on the stick of Ranford, who dishes to Stransky for the 3-2 goal. In the second, Denis Gurianov tipped a shot from Matt Mangene to tie things up and set the table for a tight third period. Texas and Chicago combined for just seven shots in the final frame, and it was Chicago who emerged with the only goal. Again on the power play, Kenny Agostino popped one in from the right wing circle. Maxime Lagace stopped 20 of 24 shots in the loss. This was Brandon Anselmini's first AHL game. He wore #12. Almost as a throw-in item at the bottom of his notebook on the Blues, NHL.com's Lou Korac started a firestorm in the AHL today. The section begins, "The Blues will house a new home for a new American Hockey League team, according to a source." The report goes on to say that the team is closing in on a deal to put their AHL team in Kansas City, working with the current owner of the Missouri Mavericks. The Blues have been affiliated with the independently owned Chicago Wolves for four years. The Missouri Mavericks vehemently denied the report. However, the connective tissue of this story makes sense in context of some other things I've heard around the league. With the entry of Las Vegas to the NHL, there are suddenly 31 NHL teams and only 30 AHL clubs. AHL president Dave Andrews believes in the one-to-one relationship between the two leagues but has been mum so far on definitive plans to add another team to match the Vegas expansion. Of course, the interesting thread in all of this is that most folks assumed that Vegas would want in on that sweet deal the California Five (and Tucson) have worked out: playing fewer games against the same geographically convenient opponents. Cities that were mentioned included Salt Lake City, Fresno and Sacramento. The Utah Grizzlies, currently in SLC, hosted AHL hockey as recently as the mid-2000s when they were Dallas' AHL affiliate. Fresno hosted the Falcons, but Sacramento has never had a pro team. Meanwhile, you could make the counter argument that Las Vegas is going to have enough on its plate next year what with starting an NHL team from scratch. Maybe this makes sense. St. Louis moves their affiliation to KC and Chicago pairs up with Las Vegas. They won't get the 68 game deal because Chicago is independently owned and would never stand for it. But you'd have a team that has been developing players for decades instead of also starting an AHL team from scratch. Las Vegas decides that they do want to kick off their own AHL franchise in the west and get the 68-game schedule and close travel times and all the other benefits associated with the local AHL team. Suddenly, Chicago has no NHL team. By my records, there isn't a deal ending this season that I would consider in jeopardy of moving. This leaves Binghamton, St. John's and now Chicago all without AHL teams in 2017-18. Las Vegas goes with Chicago next year with the plan being to eventually get their own franchise. That's the above scenario just delayed by a few years. Either way, it's a rough spot for one of the signature franchises in the AHL. 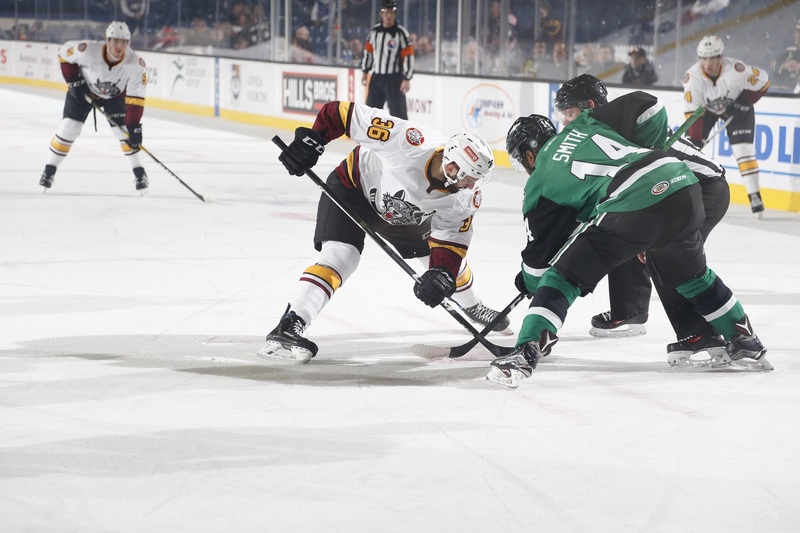 If the AHL were a team itself, the Chicago Wolves would be a grizzled veteran. Since coming over in the IHL merger, the Wolves have been a consistent playoff presence and an excellent team on the regular. This year, they find themselves hovering around the .500 mark at 8-9-1-1. They were briefly at .500 last week before losing to Manitoba on Sunday. Looking at the Wolves' schedule is a weird exercise. Chicago only plays 9 different teams this season: the seven other teams in their division and Texas and San Antonio. Chicago will not visit California or have any California team visit them. Even Texas and San Antonio only play Chicago four times each. That's 68 games among seven teams. Yuck. Chicago returns both of their netminders in Pheonix Copley and Jordan Binnington. Both are around .920 on save percentage. Brad Hunt, former OKC Baron, leads the team in points with 5-15=20. Kenny Agostino, formerly in the Calgary system, is tied with Ivan Barbashev for second. Wade Megan, the former Rampage, is in the goal-scoring lead with eight. Three of those are game-winners. Chicago is losing a lot of their games close. In their losses this season, they've never been defeated by more than two goals. Texas shook things up a bit in the lineup since their last game. In net, Texas swapped Landon Bow for Philippe Desrosiers in Idaho. Branden Troock was sent to Idaho, among forwards, and Brandon Anselmini was recalled among defensemen. As expected after last night's injury to Mattias Backman, Brandon Anselmini has been recalled to Texas for the road trip. Backman was ijured in the first last night and was noted as 'day-to-day' by Coach Laxdal. Texas hits the road for a three-game swing on Wednesday, so he said he expected to make a call. Anselmini leads the ECHL in power play assists. Forward Branden Troock was also assigned to the ECHL in a transaction earlier today. 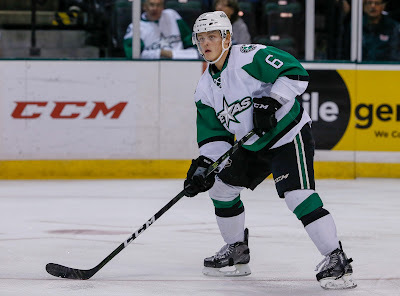 The Texas Stars, American Hockey League affiliate of the NHL's Dallas Stars, announced Sunday they have recalled rookie defenseman Brandon Anselmini from their ECHL affiliate, the Idaho Steelheads. Anselmini (an-suhl-MEE-nee), 23, is on his first career call-up to the AHL after tallying 11 points in 18 games with the Steelheads (2-9=11). The 5-foot-10, 185-pound defenseman was signed to an AHL contract over the summer after completing a four-year career at Ferris State University. Last night's game showed two things that led to transactions this morning for the Texas Stars. First, Stephen Johns is an NHL defenseman. Plain and simple. He came down for a tuneup and chance to get on the ice in a competitive game situation. He dominated with 3 goals in the two games, both Texas wins, and had each of the game winners. 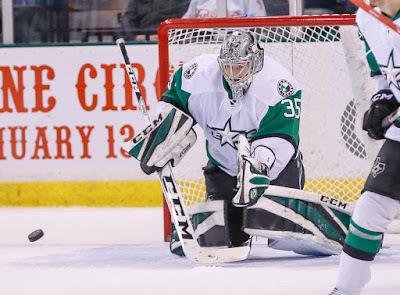 Second, Maxime Lagace might have established himself in some sort of rhythm for the Stars. His shutout last night must have bolstered the confidence of the brass in him. 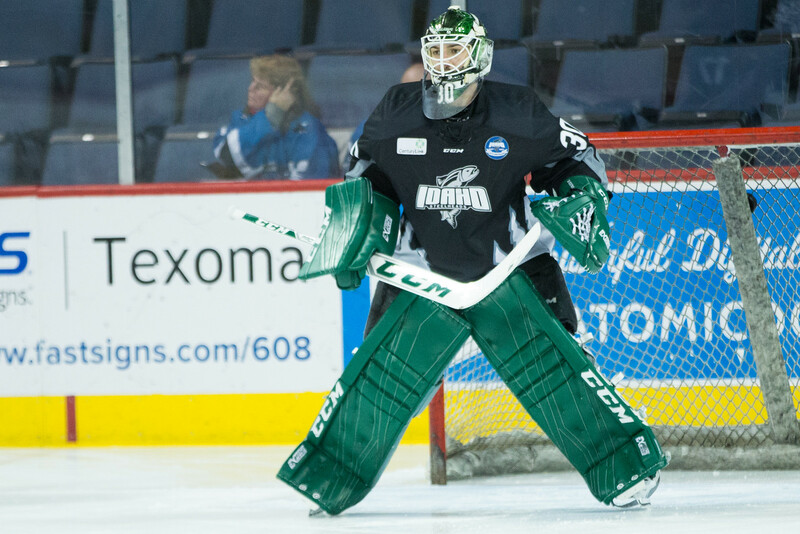 Philippe Desrosiers should be getting competitive ice himself, so he'll head to Idaho for some ice time. Landon Bow comes up to Texas for their road trip to Chicago and Manitoba. Dallas Stars General Manager Jim Nill announced today that the club has recalled defenseman Stephen Johns from the Texas Stars, Dallas' top development affiliate in the American Hockey League. Johns, 24, has produced four points (2-2=4) in 16 games played for Dallas this season. He currently leads the team with 44 hits and ranks fourth with 32 blocked shots. The defenseman has also appeared in two AHL games with Texas, recording three goals (3-0=3). The 6-foot-4, 230-pound native of Ellwood City, Pennsylvania was selected by Chicago in the second round (60th overall) of the 2010 NHL Draft. He was acquired by Dallas along with Patrick Sharp from Chicago in exchange for Trevor Daley and Ryan Garbutt on July 12, 2015. The Texas Stars also announced goaltender Phil Desrosiers has been assigned to the ECHL’s Idaho Steelheads, and rookie netminder Landon Bow has been recalled to the AHL. 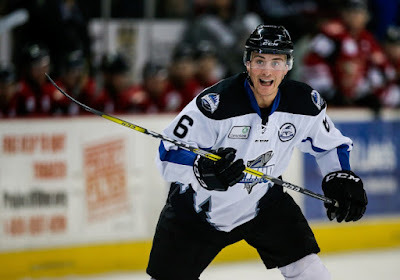 The 21-year-old Bow was signed to an AHL contract this past summer and has appeared in 12 games this season for the Steelheads. The 6-foot-5, 210-pound native of St. Albert, Alberta, owns a 2.75 goals against average and .916 save percentage in the ECHL this season with an 8-3-0 record. Tonight's game was one of those where you could pick any number of storylines to follow. Strong play across the lineup for Texas created a very complete game, culminating in a 3-0 win against the Rampage in Cedar Park. 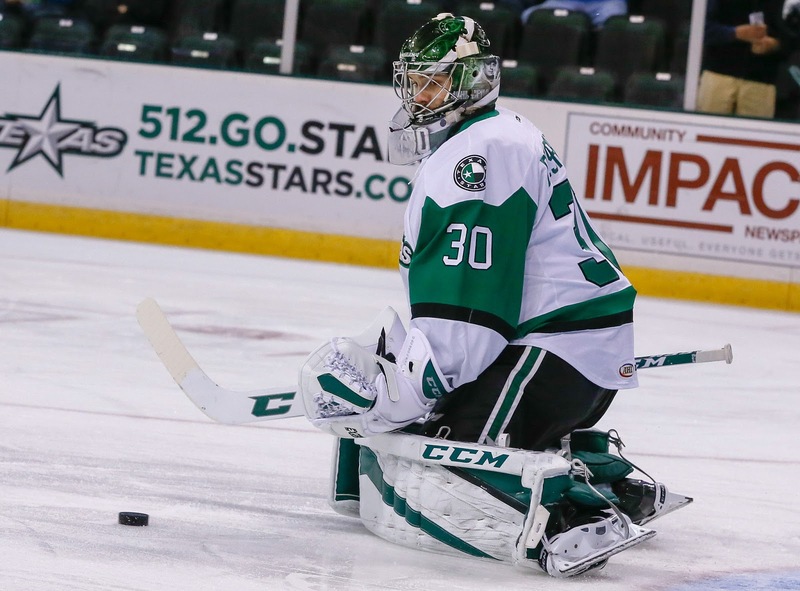 First, Texas got a fantastic performance from their goaltender, Maxime Lagace. The sophomore netminder halted the San Antonio offense and turned aside 28 shots for Texas' first shutout of the season. "I'm trying to be consistent more in my game," said Lagace, who also got the win last night. "I really wanted the shutout and I fought through it. The guys did a tremendous job in front of me on the 5-on-3 our pk unit did a really good job tonight." Lagace introduced the next high point of the game, the penalty kill. Over the past five games, Texas has scored five shorthanded goals and now leads the league with six overall. Brandon DeFazio scored this evening's shorthanded goal in the second period. Tonight, they added to that with a perfect 4/4 effort stopping the Rampage. "We've had a lot of discussion and video review on the PK," said Texas coach Derek Laxdal. "We're trying to be more aggressive on the entries and in the system. With that support and urgency and good goaltending, you're going to have a good penalty kill." The PK was tested, especially late. Texas built a lead with a power play goal and one of those aforementioned shorthanded tallies, along with an even-strength marker. The Rampage pushed hard in the third, outshooting Texas 14-3 and earning a 5-on-3 power play late. The team tightened up and energized the building with a successful kill. Andrew Bodnarchuk, Travis Morin and Stephen Johns were on the ice for nearly the entire 73 seconds. Johns carried over his excellent play in all aspects of his game from last night. He tallied a power play goal, was rubbing out players all over the ice and set a physical tone for the team. "He brought a lot of energy to our lineup with a big heavy body. He came down here with the right frame of mind, trying to build his confidence. We hope that turns into success in Dallas." Johns added, "I don't think I expected to score three goals. I just wanted ot come down here and be comfortable skating and making good decisions. I sat out a few games in a row and it's tough to sit in the stands. When I got sent down, you can say I was pissed off but I used it as motivation to play as well as I can." Cole Ully added a goal late in the second that would be the last offense for either team in the game. It was a mad scramble in front assisted by Matt Mangene and Jason Dickinson. Texas plays again on Wednesday in Chicago. Mattias Backman was lost to 'mid-body' injury in the first period. He did not return. Coach Laxdal calls it 'day-to-day' but anticipates calling up a defenseman from the ECHL. Stephen Johns is motivated. That's for sure. Last night's performance where he notched two goals and surely had a ton of hits (a stat not kept publicly by the AHL) showed that demonstrably. If Johns is trying to show that he is ready to head back to Dallas for their upcoming road trip, last night was an emphatic mark in the 'yes' column. The defenseman came down for a tune-up and it seems a quick trip back to Dallas. Watch #4 tonight to see what he can do at home to further his resume for recall. Texas needed a come-from-behind effort tonight, but Stephen Johns was up to the task. Reassigned from Dallas earlier in the day, the defenseman scored in the second period shorthanded and had the overtime game-winner as well. The Stars improved their penalty kill in at least one regard in the game as they scored not one but two shorthanded tallies. Justin Dowling's third goal of the year cmae shorthanded in the second. San Antonio scored on the power play but Johns' shorty came next. Two San Antonio goals put Texas down 3-2 as they approached the end of the third. Travis Morin's seventh of the season came unassisted in the 12th minute to tie things up. In the 3-on-3 overtime, Brandon DeFazio and Stephen Johns went on a 2-on-0 break. DeFazio got in tight and dished to Johns, giving Kent Simpson no chance at the save. These two teams will face off tomorrow night in Cedar Park. After a long layoff, Texas and San Antonio will shake off the trytophan-induced slumber and play a home-and-home set this weekend in Central Texas. These two teams have not met many times so far this season, which means you should brace yourself for many more of these matchups in the second half. In the only game of the season so far between these teams, the Rampage earned their first win of the year after going 0-4 to start. Since then, they are 7-5 but obviously are dogged by that slow start. Their record since that game would put then in the playoffs if it were the only record they had. For the Stars, Stephen Johns has been assigned to the AHL, adding some defensive grittiness to a group that is more offensively inclined. It doesn't look like Johns will be around for too long, but every game he plays can help re-instill a defensive mindset into the entire team. With Johns down in the AHL, Julius Honka is still in the NHL. He had two assists in the season series so far between SA and Texas.